So yesterday we reviewed Vancouver 2010, today we’ll go for its stand off rival, RTL Winter Sports 2010. 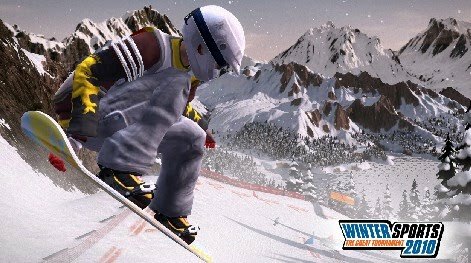 This series has had good success on the Wii, now its on the Xbox360 and PS3 – but is this years version a worth contender for best winter games game? Bypassing the olympics, this is all about building a career for your athletes to take part in bigger and bigger tournaments and win them. Here’s the duff note… there are only 8 events! Ski Jump is called Ski Flying, Bobsleigh is Bodbled, Snowcross is Snowboard Cross… it all stinks of no licences! However once in game, there’s very little difference between this game and Vancouver, however there is much more diversity in these 8 events than the 14 in Vancouver. Figure Skating is a Simon Says game, Shorttrack is a good racing game using slipstreams and a boost button which means its all about strategic timing. Infact this boost button “Adrenaline” makes an appearance in a lot of the games which thus makes this game feel a much more arcade version of winter sports. Bobsled has a boost? It does here! The best game is the biathlon as it involves all that is shorttrack, with precision shooting however even that’s over too quickly, and I own a PS2 game that’s dedicated to it (by the same makers actually) which does the sport much better justice. It’s all a bit light. Multiplayer is fun, and the career mode with a points builder similar to Bejing/RPG elemented. There’s also a challenge mode with 44 cups to be won and that’s where the trophies are. Graphics are fine, not spectacular but certainly above Wii standards. You’ve got to love the mascot dancing bunny too. Sound is encompassed by some really dodgy commentating that is a bit too serious for its own good and arcade menu music. However, at least this game has commentary, if not in game but as little pre and post event comments. Vancouver has none. Similar to Vancouver, this again is down to how many friends or online fun you can have. Sadly I’ve yet to find anyone online to play with, but two player in house works fine. Challenge mode sticks to its arcade roots (avoid the skulls!) but is all light hearted and light on content. Well, if you have to choose between Vancouver and Winter Sports, its like choosing between being slapped or spanked. Both give a quick hit of substance which then leaves you with a dull ache either wishing you had never had it to begin with, or wishing you’d have another hit but they are both sorely lacking in their one trick pony brigade. I’m very disappointed in both games, but neither really trumps the other so if you need a winter fix, Vancouver currently has the edge as at least people play it online! Good review, allthough I think you left out the most fun: Downhill Skiing. You’ll need to do quite alot of challenges to unlock all downhill pistes, but it’s worth it. The speed is pretty amazing against extreme opponents, as you more or less have to boost your way down for 90 seconds straight, and the controls are great, I think. some timetrial speedruns make for a good drinking game, cheers!